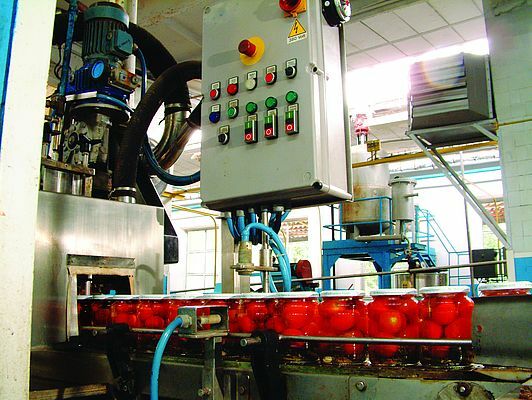 As the communications network increasingly moves onto the production floor, the need for highly reliable, robust communications solutions are challenging in the food and beverage processing industry. Harsh conditions, demand for capacity to handle large volumes of data, and regulatory requirements for hygiene and safety present significant obstacles to achieving the 99.999 percent – also known as the “five 9s” – reliability required to maintain operations. Choosing the right combination of connectivity equipment requires understanding both the environmental conditions and the increasing complexity and demands placed on networks in production environments. It’s imperative to design and build a reliable network that can ensure optimal uptime. Given the high cost of losses due to both unrecoverable production time and the litigious threat associated with product safety, downtime is not an option in the food and beverage industry. According to Belden, the average downtime in the industry is estimated to be as high as 500 hours per year, with the loss valued between $20,000-$30,000 per hour. Networking equipment in these environments must be able to withstand these conditions. On top of designing a reliable and robust networking environment that can perform in spite of harsh conditions, the system must also be increasingly sophisticated to meet the demands of the network. As IIoT expands, machines running machines is becoming the norm in production environments. For food and beverage, processors find exponential growth in two key areas: the variety of data and the volume of data. Automation requires an immense array of data in an equally diverse range of formats. The variety of data can be anything from the status messages about contamination levels to monitoring information about operating temperatures. Gartner Research estimates that 25 billion “things” will be connected to the Internet by 2020. The amount of data transferred will explode. While the number reflects the sum total of the entire digital universe, manufacturing is expected to be a significant contributor to the volume of connected devices. •	Demonstrate a proven track record of resistance and impermeability to aggressive chemicals and cleaning agents. Passive wiring: Sensors and actuators are connected either centrally to a control cabinet via separate cables or de-centrally with I/O modules and common power lines. Both configurations provide the transmission of binary or analog signals, which can only be read. Of the two, the use of I/O modules is the more economical choice, as neither terminal blocks nor cable glands have to be installed, and the availability of cables that come pre-assembled with standardized M8 or M12 connectors eliminates the need to remove insulation from the cable ends and attach ferrules. Active wiring configurations: In manufacturing operations, the trend toward smarter processes is increasing the deployment of active wiring configurations. The variety of information that must be transmitted and evaluated requires bi-directional communication made possible with active wiring. In these environments, Ethernet is quickly becoming the preferred transmission protocol, along with field bus systems. Given the wide variety of data and how it is used, I/O modules that can increase the flexibility of wiring solutions are preferred. Models are available that are designed for passive wiring configurations, providing a cost-effective alternative for transmitting binary signals. Others support the transmission protocols required for bi-directional communication, including Industrial Ethernet variants like Profinet and Ethernet/IP, and field bus systems such as DeviceNet, CANopen and AS Interface. For optimum wiring, it’s important to consider the resistance of I/O modules to the harsh effects of the environment in which they are required to perform. Apply the same criteria for protection, tolerance and performance used to measure connectors when evaluating I/O modules to ensure reliable data transmission.